They offer a large quality and durability range. To have a high quality finish, make sure you choose a product that mostly contains urethane and not acrylic resins. Due to their complex molecular structures, the waterborne formulations offer major benefits: better abrasion resistance, greater substrate adherence, better flexibility and higher contaminant resistance. Unlike the oil based polyurethanes, the luster level of the waterborne finishes do not affect their long-term durability. For example, a matte luster (10%) is as resistant as a high-gloss luster (90%). They produce no odor and have no negative effects on the home owner’s health. They can therefore stay home upon application and there is no need of emptying the pantry! When applied, they form a thinner layer of product on the surface, but that do not compromise their long-term durability. The reason behind the thickness difference between the waterborne finish and the oil based finish is simply the difference between the solid material quantity that can contain the water (30%) and the oil (50%). Therefore, the quantity of solid material in an oil based finish is approximately twice as high as in a waterborne finish. However, the waterborne polyurethane has a tendency of being less resistant to calcium, such as the snow on boots during winter time. It is therefore recommended to protect your floors with a carpet near the entrance doors. 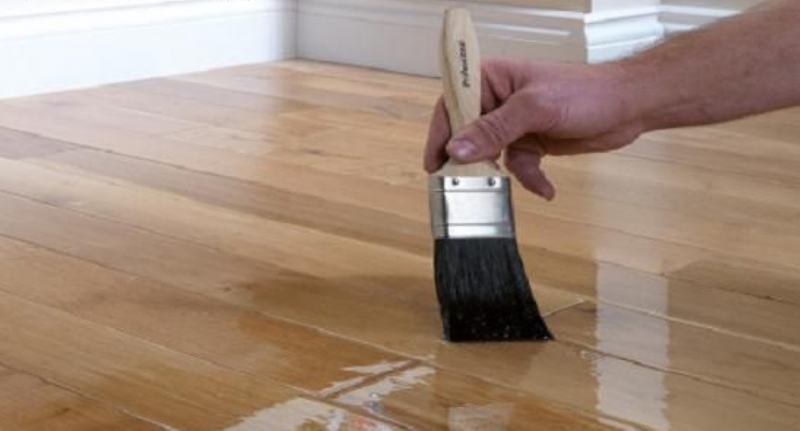 If your floors are already damaged by calcium, it is important to properly prepare the surface before the finish application with a cleaning product that is recommended for your type of floor. Usually called Varathane, they are often chosen because they are economic, easily applicable and easy to use on wooden floors. However, the strong smell they release strain the residents to leave their house upon application. The long-term durability of these finishes also tends to be a weakness. Having a very low scratch-resistance, the restoration has to be done more frequently. Moreover, upon application, the oil based finishes already has a yellowish tint that tends to amplify a lot as time goes by. The trend being to pale flooring, it can represents a significant disadvantage of this type of finish. They also are environmentally and healthily harmful products. A Canadian government norm, effective since 2010, regulates the maximal VOC (Volatile Organic Compound) rate that can be found in finishes that are sold in gallon. Since the oil based polyurethane finishes exceed that rate, the manufacturers are forced to sell their product in a pint format, which can be annoying when you have a large surface to finish. We hope those informations have enlightened you on which polyurethane finish to choose depending on the project that you have to complete. If you have questions for which we couldn’t give an answer here, feel free to contact our expert team that will be able to guide you through your project.